A good friend shared that message on my Facebook timeline more than a year ago. I use it today in my PowerPoint slide presentations at workshops. Sometimes I reinforce those words by reading from the preface of my mother’s autobiography, which I published after her death. The four panelists who will summarize their family migration stories during the NSN conference this summer are recording their stanzas partly because I goaded three of them into it as part of a spiritual memoir group at church. The fourth panelist, a good friend, had already realized the urgency of recording her family’s ethnic and migration saga following the death of her mother and the remarriage of her father less than a year after the death. Karen Cox’s grandparents landed in Pennsylvania after leaving Eastern Europe. They operated a bakery and Karen had almost daily contact with them, soaking up their ethnicity and folklore while seated around the family dinner table savoring sweet confections. Karen wants to capture those precious stories and preserve all the physical evidence of their lives for her son and for her siblings. She even has the leather suitcase her grandfather packed before he came to the U.S. She is documenting his stanzas. Joseph Matovu had told the story of his exodus from Uganda to the U.S. so many times he was sure no one wanted to hear it again. Fact is, his son has not yet visited Uganda or seen the family compound that Joseph and his wife will return to in their older age. Joseph now realizes the need to document his cultural and religious heritage. Someday his son will want to know how Joseph has managed to thrive for most of his adult life in a wheelchair. 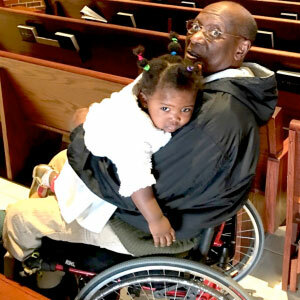 And he needs to understand that his father had a profound impact on the entire city of Kansas City in his tireless advocacy for disabled accessibility. Corey Sorio’s children tend to roll their eyes when she launches into yet another family story from the Philippines. But this retired nursing instructor, who regularly returns to her country and travels to others for medical missions, is writing stories so rich in detail and life lessons that when she is finished they will know her as an individual, not just a mother. She has preserved and celebrated her heritage by being involved in a Filipino music group and by cooking traditional foods for herself and her family. Maureen Anunwa knows what it feels like to overcome the cultural limitations she inherited from her native Nigeria. She fiercely battled the assumptions that her countrymen held that would have kept her in a violent marriage, just because her husband’s family paid a bride price for her. She has shown her children that a woman of intelligence and determination can build a new life, in a new country. And just a few months ago, she brought her own three children out of Nigeria to live with her here. Despite some limiting cultural mores, Maureen teaches them her country’s values so they will not succumb to the disrespectful ways and attitudes of her country of adoption. She does this by gentle example, instruction and by leaving a written record. Joseph, Corey, Maureen and Karen are documenting and preserving their family symphonies before the music fades into eternity. How about you? Will you sing the stories of your ancestors and of your own family? Or will the grave silence your personal folklore? Anne Tezon has been telling other people’s stories for decades, beginning at Mizzou’s Journalism School. After serving in the Peace Corps in Brazil, telling Brazilian stories, Tezon returned to the States to uncover rural Missouri stories as a newspaper editor. She later told the stories of farmers and agri-businesses for the Mo. Department of Agriculture, then came back to the small town she had served as editor. She purchased the paper and told stories for another 30 years, retired and moved to Kansas City in 2011. She is now a memoirist and book publisher . . . still telling stories.